There has never been a shortage of people proposing miracle medical cures for various ailments, conditions, and diseases. In the 19th century, women would line up to buy vegetable compounds to treat hormonal symptoms, people would buy swamp roots to treat kidney problems, and hippopotamus fat was used as an ingredient to treat baldness. Medical compounds with questionable effectiveness were known as nostrums or patent medications, even though most were never actually patented. Some patent medications actually worked but had toxic/negative side effects, such as slow death from mercury poisoning when mercury was used treat syphilis or addiction from treating colicky infants with opium. After 100 people died from a drug tainted with an untested solvent in 1937 (known as the Elixir Sulfanilamide tragedy), Franklin Roosevelt signed the Food, Drug, and Cosmetic Act, which increased regulation over medication, required pre-market testing of all new drugs, and banned false therapeutic claims in drug labeling. 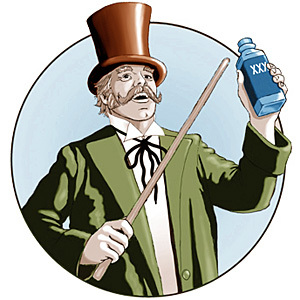 These days, suspicious claims of supposed miracle medical cures still exist. The people most vulnerable to trying these treatments are those who are faced with an incurable disease that modern conventional medicine cannot effectively treat or those who have not responded to curable diseases via conventional medicine. These supposed treatments can now be easily discovered with a quick internet search, but how are consumers supposed to evaluate their effectiveness and how should healthcare providers respond to patient questions about these treatments? Below I will offer some tips on how to do this by using a modern example: the claim that Alzheimer’s disease can be effectively treated or reversed by using coconut oil. This is based on the theory that coconut oil will provide the brain with an alternative source of energy (ketones) due to an impaired ability to use its usual energy source (glucose). STEP 1: SEARCH THE PEER-REVIEWED MEDICAL LITERATURE: The best place to search the medical literature for peer reviewed scientific research is PubMed. All searches are free, most results contain a summary of the findings, an option to read the entire article (for free or purchase), and contact information for the authors to request a copy of the article. Peer-review acts as a quality control. Articles that have not been peer-reviewed and are merely published on a blog or a website only, have less credibility because they lack peer review. There are no articles on PubMed researching coconut oil as a treatment for Alzheimer’s disease. However, there was an article published by Granholm and colleagues in 2008 showing that a diet high in hydrogenated coconut oil (which contains harmful transfats not found in organic coconut oil) in rats can profoundly impair memory and the structure of the hippocampus (the main part in the brain responsible for memory). Strike 1 against coconut oil, at least the hydrogenated type. See the articles on Lucky Strike cigarettes and Oxydendrine for another discussion of the importance of Step 1. STEP 2: EVALUATE THE QUALITY OF PEER REVIEWED RESEARCH: Although peer reviewed research is generally higher quality than non-peer reviewed research, there are many peer reviewed articles than contain significant design flaws, limiting the conclusions that can be drawn. The best research evidence comes from studies in which patients were randomly assigned to treatment groups, in which neither the treater or patient are aware of the specific treatment (this is known as being double-blind), and in which one of the treatments was a placebo (a substance containing no actual medication). The less the study contains these features, the less confidence you should have in the results. STEP 3: RESEARCH WHO IS PROMOTING THE TREATMENT: It is important to evaluate the person or group of people promoting the supposed treatment to determine if there are reasons to cause suspicion about the accuracy of the claims being made. Examples can include a financial conflict of interest, desire to help a loved one with the proposed treatment, or anger towards conventional medicine. Coconut oil treatment for Alzheimer’s is mainly promoted by a single person (a physician) whose husband has Alzheimer’s disease. This doctor is selling a book based on the claim and has published comments on a website taking personal credit for outsmarting drug companies along with apparent antipathy towards those companies that make “monopoly profits.” This is not to say that family of sick loved ones cannot come up with useful treatments for uncurable conditions. In fact, Augusto and Micheala Odone did exactly that when they discovered that very long chain fatty acids from rapeseed and olive oil can treat adrenoleokodystrophy (a rare and deadly genetic metabolic disorder). The difference, though, is that there is peer reviewed research to support this treatment. Overall, strike 2 against coconut oil. STEP 4: BE SKEPTICAL OF SUSPICIOUS CLAIMS: As a general rule, if it sounds too good to be true, it usually is. One example is a claim that you can cure obesity by allowing people to eat whatever they want, such as in this 39-Year-Old Obesity Fraud. Or, claims that the treatment can cure just about anything such as Pink Pills for Pale People, the Electric Chain Belt or The Tapeworm Diet. Another good example is a claim that an incurable disease can be cured with the proposed treatment. The fact is that Alzheimer’s disease is incurable and causes progressive degeneration of brain tissue, yet the claim is being made that coconut oil can reverse Alzheimer’s disease and totally halt brain atrophy. These claims are partly based on the doctor observing changes in her husband after using the coconut oil, which leads to a subjective investment in believing the treatment will work. This is not the standard by which medication effectiveness is judged and is very far from the randomized, double-blind, placebo controlled studies mentioned above. Strike 3 against coconut oil. STEP 5: RESEARCH WHAT RESPECTABLE ORGANIZATIONS DEVOTED TO THE CONDITION SAY ABOUT THE TREATMENT: If the supposed treatment is not mentioned on professional organizational websites or medical literature devoted to the condition, that is reason to be suspicious. If the treatment is mentioned and discredited, this is even further reason for suspicion. Here is some of what the Alzheimer’s Association says about coconut oil treatment: "A few people have reported that coconut oil helped the person with Alzheimer’s, but there’s never been any clinical testing of coconut oil for Alzheimer’s, and there’s no scientific evidence that it helps." Coconut oil is an ingredient in a medical food marketed for Alzheimer's disease known as Axona, but the official position of the Alzheimer’s Association is that there is no evidence that medical foods help treat this condition. Strike 4 against coconut oil. In the end, always be cautious and skeptical and be careful about what home remedies you use to treat a loved one, because you may actually cause more harm than good. I have been giving my 51 yr old wife coconut oil and MCT Oil (also used by bodybuilders) since her diagnosis with early onset AD in June 2011. I began getting unprompted comments from friends & family in August 2011 that my wife seems "more like herself" lately, rarely repeats herself, and participates more in group conversations. We use only extra virgin coconut oil, NOT hydrogenated oil. The active ingredient in medically approved food AXONA is MCT Oil, and coconut oiloil proponent Dr. Mary Newport has consulted closely with Dr. Bill Veech at NIH who has researched the beneficial effects of ketones (found in coconut & MCT Oil) for over 30 years. A ketogenic diet has been used to treat severe cases of epilepsy since the 1930's. I'm not a doctor, but my wifes doctor is Chief of Neurology at one of the Top 10 medical schools in the US. He was pleased with my wife's reports of improvement at our last appt in October, has a spreadsheet of what I give her and how much in terms of oils & supplements, and told us "I cannot argue with success, whatever you're doing seems to be helping so keep it up." We cannot wait for 10 years of clinical trials to confirm what, if any, of what she is taking is helping or how much ... especially when it's a food and our doctor approves and sees no harm in what we're doing. My belief is that if the doctor believes it doesn't hurt, and 3 reputable sources convince me it might help, we're going to try it. What do we have to lose? We're not kidding ourselves that we have cured AD, but if we can slow the progression by even 5% or 10% it's worth the effort. "A few people have reported that coconut oil helped the person with Alzheimer’s, but there’s never been any clinical testing of coconut oil for Alzheimer’s, and there’s no scientific evidence that it helps." Yes, I hear that phrase alot whenever there are questionable medical claims that lack evidence to support it. Actually, absence of evidence does imply absence of evidence, it just not always equate to evidence of absence. Until we have the evidence, people need to be cautious. What many people fail to realize who like to use this Sagan quote as a reason to maintain their beliefs is that sometimes the absence of evidence really is evidence of absence. If our goal is to objectively evaluate treatments, I'd be cautious with statements like the one in Step 4: "The fact is that Alzheimer’s disease is incurable... ". Many diseases were incurable once. We hope that many diseases move from being incurable to being curable in the future. We should not consider "incurable" a permanent condition of any disease and use it as a fact to discredit claims. We should encourage people who are making claims to conduct strong studies, but we should not state incurability as a fact. Part 4 is meant to reflect how things are now, not a permanent state. My 67 year old wife is suffering from advanced Alzheimer's and the standard medications have done no apparent good. What is the harm in trying coconut oil if one uses the pure non-hydrogenated oil? You must take into account that a diagnosis of AD is, at this time, a death sentence, with declining mental faculties beforehand. I would much rather have my wife return more to her previous self, even if there are serious long-term complications (and I know from previous discussions with her that she would completely agree). I can't think of a more serious long-term complication than a diagnosis of Alzheimer's. It may not do any harm but whenever someone takes anything in excess it can cause harm. But my main point is that there is no scientifically acceptable proof that it does any good. I am sorry to all who are dealing with a family member with Alzheimer's situation. Having evaluated, diagnosed, and worked with many such families, my sympathies go out to all. It's fine to have theoretical models about why a certain treatment may work. But the next step is to put the hypothesis to the test. A double blind randomisized placebo trial is the best evidence but the point is that there is literally no current peer reviewed evidence based literature to show that coconut oil effectively treats Alzheimer's disease. For over 40 years Coconut Oil has gotten some really bad publicity from other oil producers and the medical community which still exists today, but nothing could be further from the real truth about this beneficial superfood. It’s been said that Coconut Oil is loaded with saturated fat and that is true, but it’s only half the truth. Coconut Oil has saturated fats, but these saturated fats DO NOT cause any problems with cholesterol or increase the risk of heart disorder. On the contrary, Coconut Oil is loaded with lauric acid, oleic acid (omega-6), gamma linolenic acid (GLA) and conjunctive linoleic acid (CLA) which are highly beneficial nutrients and have wonderful health benefits. Islanders have been consuming coconuts for hundreds of years, sometimes over 50% of their entire diet. Heart disease is almost non-existent in these cultures. Lauric acid helps boost the immune system and has natural anti-bacteria, anti-viral and anti-fungal properties. Omega-6 helps keep healthy arteries, veins and heart function. It also helps with using fat in your blood and excess fat in the liver to be burned as energy which helps with increase athletic performance and weight loss. GLA has hormone balancing benefits for men and especially women with premenstrual syndrome and menopause problems. Contributes to the reduction of LDL (bad cholesterol) and raising HDL (good cholesterol). An excellent oil to cook with giving food a really nice, light flavor and it’s a healthier oil to use to fry foods with because Coconut Oil has a higher heat index than other common cooking oils. Remedy for skin problems and scalp conditions like dandruff and eczema. Coconut Oil has been shown in research data that it helps with thyroid problems. So you see, Coconut Oil has a place in your overall nutritional health lifestyle and finally is getting the proper recognition it deserves. Thanks Poston. This, I agree with. I think it is ridiculous how coconut oil was banned from movie theater popcorn. I used it on my home popcorn all the time and it is delicious. What if we approach the question of a randomized, double-blind, placebo-controlled, multicenter trial of coconut oil for the treatment of Alzheimer's disease from a slightly different angle? Coconut oil is 57% medium chain triglycerides (MCTs). MCT oil is available in health food stores and on the Internet. In August 2009 the following study was published in Nutrition & Metabolism. Study of the ketogenic agent AC-1202 in mild to moderate Alzheimer's disease: a randomized, double-blind, placebo-controlled, multicenter trial. The paper's lead author, Samuel Henderson, is the founder of Accera (http://www.accerapharma.com/index.html), the biotechnology company that developed Axona (http://www.accerapharma.com/axona.html). Axona is an FDA approved medical food used to treat Alzheimer's. (Axona was at one point named Ketasyn http://www.medicalnewstoday.com/releases/81005.php) If you click on Dr. Henderson's name, you will find more papers by him on PubMed related to the treatment of Alzheimer's with medium chain triglycerides. Dr. Mary T. Newport discusses this on pp. 57-61 of her book Alzheimer's Disease: What If There Was a Cure? The Story of Ketones (Laguna Beach, CA: Basic Health Publications, Inc., 2011 ISBN: 978-1-59120-293-6). MCT oil, which is derived from coconut oil, has been shown to treat Alzheimer's disease in a randomized, double-blind, placebo-controlled, multicenter trial. Caprylic acid is the active ingredient of Axona, which is marketed as a “medical food.” Caprylic acid is a medium-chain triglyceride (fat) produced by processing coconut oil or palm kernel oil. The body breaks down caprylic acid into substances called “ketone bodies.” The theory behind Axona is that the ketone bodies derived from caprylic acid may provide an alternative energy source for brain cells that have lost their ability to use glucose (sugar) as a result of Alzheimer’s. Glucose is the brain’s chief energy source. Imaging studies show reduced glucose use in brain regions affected by Alzheimer’s. The chief goal of Phase II clinical studies is to provide information about the safety and best dose of an experimental treatment. Phase II trials are generally too small to confirm that a treatment works. To demonstrate effectiveness under the prescription drug approval framework, the FDA requires drug developers to follow Phase II studies with larger Phase III trials enrolling several hundred to thousands of volunteers. The manufacturer of Ketasyn decided not to conduct Phase III studies to confirm its effectiveness. The company chose instead to use Ketasyn as the basis of Axona and promote Axona as a “medical food.” Medical foods do not require Phase III studies or any other clinical testing. The Alzheimer’s Association Medical and Scientific Advisory Council has expressed concern that there is not enough evidence to assess the potential benefit of medical foods for Alzheimer’s disease. For more information, please see the Medical and Scientific Advisory Council statement about medical foods. Some people with Alzheimer’s and their caregivers have turned to coconut oil as a less expensive, over-the-counter source of caprylic acid. A few people have reported that coconut oil helped the person with Alzheimer’s, but there’s never been any clinical testing of coconut oil for Alzheimer’s, and there’s no scientific evidence that it helps. (emphasis mine). My mom has AD and my older brother appears to be in the first stages of dementia (possibly AD as well), my younger brother has actually scared me on two occasions by displaying AD but then it disappeared. So far (thank God) I have not shown any signs (unless I did and just don't remember it happening - but so far no one has said anything about me having AD before). I believe that because I do yoga and mantras that that is (somehow) helping me to keep my sanity. But I digress. After having read your article as well as all of the comments here I would like to only point out Lorenzo's Oil. Here too were people who tried various combinations of oils to help their son. So while it may be true Phase III tests were never done on Axona - there are probably things going on in the background that may have caused the company to not do the Phase III test. (Like pressure from investors to make a buck.) I am not saying Phase III tests should not be done - far from it. They should be done and done quickly as they were eventually done on Lorenzo's Oil. But for the time being we may have something that - although not perfectly tested - may help and I will try it out on my mom and brothers now that I know of it. There is no randomized, double-blind, placebo-controlled, multicenter trial of foods being able to save life. We don't need randomized, double-blind, placebo-controlled, multicenter trial studies to establish basic known scientific facts such as that living organisms need food to live. It is a big leap for many people to even begin to examine whether or not MCT therapy (medium chain triglycerides found in coconut oil) could impact Alzheimer's through prevention, and halting the progression of those who have it. I understand that. The reaction that some have to this information is almost angry. In some ways I think of Galileo and his belief in a heliocentric solar system. I was also thinking about another disease that plagued mankind for thousands of years. This disease was cured and prevented without a prescription drug. It was a disease that left untreated was fatal and literally killed millions yet the disease had a simple fix. Here are the symptoms that accompanied the disease. After 1–3 months, patients develop shortness of breath and bone pain. and eventual death are frequently seen. What was the disease that killed so many over thousands of years? Scurvy. Today scurvy is known to be caused by a nutritional deficiency, but until the isolation of vitamin C and its direct link to scurvy in 1932, numerous theories and treatments were proposed, often on little or no experimental data. This inconsistency is attributed to the lack of vitamin C as a distinct concept, the varying vitamin C content of different foods (notably present in fresh citrus, watercress, and organ meat), and how vitamin C can be destroyed by exposure to air and copper. Part of the confusion came because there were people groups who existed almost exclusively on fresh meat and fat yet these people did not get scury. What was not known is that ascorbic acid (vitamin C) is available in fresh meat...causing the confusion. Treatment by fresh food, particularly citrus fruit, was periodically implemented, as it had been since antiquity. Documentation goes back at least as far as the 1400's suggesting that scurvy could be cured with citrus fruit. Citrus fruit as a prevention and cure for scurvy was finally proven in 1753 in the first ever clinical trial by Scottish surgeon in the Royal Navy, James Lind, who first proved it could be treated with citrus fruit in experiments he described in his 1753 book, A Treatise of the Scurvy,though his advice was not implemented by the Royal Navy for several decades. The ultimate cause of scurvy was not known until 1932, and treatment was inconsistent, with many ineffective treatments used into the 20th century. In the elapsed time between the proposed cure and clinical trials...millions died from this preventable disease. Let's hope and pray that it does not take hundreds of years between the discovery of what can help prevent and treat Alzheimer's Disease, and its proof through clinically proven medical trials. What a tragedy that would be for our nation and the 15,000,000 people projected to have Alzheimer's disease by 2050. After pouring over the science behind ketone therapy, it is my belief that Dr. Mary Newport, author of Alzheimer's Disease: What if there was a Cure?, is one who like the early doctors who treated scurvy, was proactive and based on research she discovered embraced a very real treatment of Alzheimer's. Had she waited for this country's mammoth medical machine to catch up and confirm the validity of MCT's as an accepted treatment her husband's brain would almost certainly be at a place where he was no longer with her. CRP: That's all well and good but the bottom line is that the link to vitamin C and scurvy was ultimately proved via scientific research not solely based on anecdotal stories. Anecdotal evidence can form the basis of important scientific discoveries. My main point is that we are far from having any clear scientific proof that Alzheimer's disease is going to be cured by feeding people coconut oil. My main point is that we are far from having any clear scientific proof that Alzheimer's disease is going to be cured by feeding people coconut oil. And what are the millions of people to do while they are waiting for that proof. As you know it is not the "magic" of coconut oil that is offering hope. It is the ketones, made available to the brain as an alternative fuel source, derived from the MCT in coconut oil that is the key. Every proponent of ketones as a fuel source welcomes medical trials. Where is that funding going to come from? From drug companies? Why would they fund research for something already available on the grocery store shelf? Ultimately the goal is not coconut or MCT oil to treat Alzheimer's but rather concentrated ketone esters, which give ten times the punch of the ketones released by coconut oil, MCT oil or Axona. NIH's Dr. Richard Veech has developed the ketone ester. Dr. Mary Newport has consulted with Dr. Veech, advocated funding of research for Dr. Veech. The good news is that Dr. Veech's ketone ester is the subject of a University of Oxford drug trial that is currently recruiting. "Ketogenic Diets for Symptoms of Parkinson's Disease"
The trial is for Parkinson's however, not for Alzheimer's. Perhaps this will then progress to the funding of an Alzheimer's trial. So, maybe the machine is starting to slowly roll...inch by inch. As to your earlier comment about Axona...you have correctly pointed out that Axona has ingredients in it that are not in coconut oil. However, the "active" ingredient is the byproduct of ketones produces by the breakdown of MCT oil in the liver. The ketones are the same whether they are broken down from Axona's source of MCT, Caprylidene [C8] or coconut oil's MCT source Caprylic Acid [C8], [C12]Capric Acid, and [C10] Lauric Acid. Axona went through phase 1 and phase 2 trials with the full intention of moving on to phase 3. Some Alzheimer drug trials have been abruptly halted because the drug was causing notable harm. With Axona it was exactly the opposite. The trial was halted before phase 3 because the phase 2 trial was so successful. Rather than go through the lengthy phase 3 trial they opted for the option of putting Axona in the hands of the medical community immediately, as a medical food (prescription needed). So, in the meantime...which we wait for the mammoth medical machine to slowly begin turning, family members have the very real option of trying coconut oil as a source of MCT producing ketones for their family members. When it comes to Alheimer's they have very LITTLE to lose and much to gain. edited to add: Why coconut oil as a source of MCT instead of Axona? Axona - $ 3.00 for for one dose...$0.22 for MCT's from coconut oil. Those millions of people can do what they like of course. However, my point is that people need understand is that there is simply not the evidence available yet to support this as being anywhere even close to an accepted treatment for Alzheimer's yet and not be misled by false hopes and anecdotal claims of miracle cures. There are enough companies making foods with MCTs, enough advocacy organizations, and enough people with family members and friends that know of people with Alzheimer's disease that could all be sources of funding/donations for clinical trials of MCTs vs current treatments/placebo. Trust me, if this form of treatment really works and can be proven with solid research, I'll be very happy to promote and support it. But we're not their yet. As to Axona, the official position of the Alzheimer's disease is that Axona and other medical foods do not have sufficient evidence behind them to support that they can effectively treat Alzheimer's disease. Are we to seriously believe that the Alzheimer's Association, which does so much every day to help patients and families with this condition, is involved in some sort of conspiracy with the drug companies to prevent a real cure for Alzheimer's disease from being found because it's not funded by big pharma? A groundbreaking research study of a ketone ester in an Alzheimer's mouse model was released for publication January 4, 2013 in Neurobiology of Aging by Yoshira Kashiwaya, M.D. and others in the laboratory of Dr. Richard L. Veech at the NIH in Rockville, Maryland. This study showed that, compared to animals fed a normal control diet, the Alzheimer's model mice who were fed the ketone ester (D-beta-hydroxybutyrate-(R)-1,3-butanediol) had significantly less amyloid and tau protein that form the plaques and tangles in the Alzheimer's brain, and the animals showed reduced anxiety, and improved learning and memory compared to the mice fed the control diet. Kashiwaya Y, Bergman C, Lee JH, Wan R, Todd King M, Mughal MR, Okun E, Clarke K, Mattson MP, Veech RL. Because the Dr. Veech's ketone ester is not yet available, the only source for ketones found in the ester is a food available for purchase on the supermarket shelves...and that food is coconut oil, which provides about 1/10 the amount of ketones found in Dr. Veech's ester. Dr. Veech, who interned with the famed Dr. Kreb(as well as returning for research at Kreb's lab every year until Kreb died), worked closely with Dr. Newport to determine how much coconut oil her husband should consume, as well as conducting lab work to chart the ketone levels in Dr. Newport's husband's blood following the consumption of coconut oil. Dr. Veech travelled with Dr. Mary Newport to the International Alzheimer's Convention where she was one of the presenters. Dr. Newport clearly states in the introduction of her book that coconut oil is not a cure, it is a temporary source of ketones while awaiting the availability of the ketone ester. She clearly states that the purpose of the book is to raise the awareness of Dr. Veech's ketone ester research and its need desperate need for adequate funding. The Department of Defense is also conducting ketone ester research at the University of Florida. This research centers around the benefits of ketone ester in cases of traumatic brain injury. The ketone ester can be administered orally orintravenously. The hope is that when it becomes available it can be administered on site after traumatic brain injury. Coconut Oil is not a drug...it is a readily available food source that is available on most all supermarket shelves. As Dr. Newport has pointed out,those with loved ones who are suffering from Alzheimer's don't have five years to wait for a ketone ester. It will be too late for them. She isn't advocating a radical herbal remedy...a dangerous substance...instead she is advocating a safe, healthy food product that can provide an added benefit of ketone bodies which are available as fuel to insulin resisitant brains. Ironically, since writing my comments on your post (CRP) my mother has been diagnosed and she started on coconut oil 2 months ago. The improvement has been amazing. Two USF researchers manning a metabolic assault on debilitating diseases such as ALS (often referred to as Lou Gehrig's Disease), epilepsy and even brain cancer are attracting interest from an unexpected potential partner. The U.S. Department of Defense and Office of Naval Research (ONR) is interested in the medical research by Drs. Csilla Ari and Dominic D'Agostino for its potential to increase the physical and cognitive performance of war fighters. That's great, Cynthia. I am all for seeing what new scientific results will show, but right now this is basically a recruiting article for a pre-clinical study and I note where it says: "Excited by the potential of the science, yet lacking statistical evidence...". This is crucial to remember at this point for people who want to give their family members with Alzheimer's spoonfuls of coconut oil every day. Well if you wait for studies you will wait forever. Who will fund such study when it can't generate money to pharmacia? Anything natural that works they classify as drugs and then they release a not so good working (less ingredients) and double the price. Glucosamine is like this. So no big company will fund anything that will not make them profit. Time to wake up. Not true at all and this is just an excuse not to gather the proper scientific evidence. Studies are funded all the time by philanthropists. So many people have been affected by Alzheimer's that there are plenty of people who would contribute to a well-designed study on coconut oil treatment to test out scientifically if it really works. Studies based on such funding happens all the time. The pharma conspiracy theories are really getting quite old already. Time to gather the data. Cynthia: The study you site in the Neurobiology of aging is interesting but there a few points worth noting that should temper the conclusions we can draw from it. First, the findings of the study only showed "relatively subtle" learning and memory improvements not the drastic improvements noted in anecdotal stories. I am glad that you believe there is amazing improvement in your mother but in science we don't make treatment recommendations to the public based on anecdotes. I can site centuries worth of supposed treatments for all sorts of problems that people swore worked for themselves and their families that never panned out. Secondly, note on Dr. Newport's blog that even she says that "..for the first time, shows that ketones could lessen the changes that occur in the brain..." This is exactly what I have been saying all along. There were no findings supporting this hypothesis prior to this study and there still are none in humans. This is important because treatment in mice models of Alzheimers do not always translate to humans as discussed in the article below. If science bears this out eventually, I'll be all for it. But people need to know where the science is at with this right now and not get false hopes. Here is the article. Trends Neurosci. 2010 Aug;33(8):381-9. doi: 10.1016/j.tins.2010.05.004. Epub 2010 Jun 9. 'Too much good news' - are Alzheimer mouse models trying to tell us how to prevent, not cure, Alzheimer's disease? Scores of compounds ameliorate cognitive deficits or neuropathology in transgenic mouse models of Alzheimer's disease (AD), yet these triumphs in mice have not translated into successful therapies for people. Why have studies in mice failed to predict results of human trials? We argue that most transgenic mouse 'models of AD' actually simulate the asymptomatic phase of the disease, and the results of interventional studies in these mice should be considered in the context of disease prevention. In addition, recent advances in imaging technology and biomarker discovery should aid in comparisons of mouse and human neurological status and, importantly, might allow us to predict better the response of people to drugs tested in mice. Yes, I am absolutely aware that we are in the beginning stage of trials. That is exactaly the point. It will be years before the trials are completed and if Dr. Veech and Dr. Newport were advocating anything other than a readily available FOOD product I would agree with caution. But good grief...get over it already...it is FOOD...not experimental drugs we are talking about here. It may help it may not...but we are talking about a FOOD that does not need FDA approval. I think that ten years from now this blog post is going to immortalize you. The notion that we do not need to worry about the health effects of something because it is food and not a drug is entirely misplaced. Too much of any food will have harmful health effects. And this is exactly the type of situation that is ripe for such a problem to occur. People who are understandably completely desperate for a treatment to work, upset at mainstream medicine for not finding an answer, who have conspiracy theories against drug companies, who gravitate towards alternative therapies with literally ZERO scientific evidence in humans that it works for the condition of interest, and/or who have a religious-like adherence to the product and one person who promotes it heavily, will be biased to say it is doing wonders when it may be doing nothing at all and will be highly prone to overdoing it with this product giving people much more than necessary under the belief that more always is better. I'm not worried in the least about being immortalized in any negative way by any of these postings because the bottom line is I have nothing against coconut oil (in fact, I have some in my pantry and use it on popcorn) and would love if this really panned out in the future as a treatment. If so, I'll be the first to say great and encourage people to use it. But right now, the point still stands: Zero scientific evidence this helps in humans for Alzheimers and people need to know this before they start feeding globs of it to their sick family members. Alzheimer's Association's official position says the same thing regarding the lack of evidence of this as a treatment. The waiting 5 to 10 years argument holds no water to me. This hypothesis has been out there for a long time and studies could have begun much longer ago.